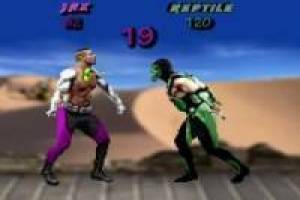 Relive the best fights of the classic game of peels Mortal Kombat. This game will be starred by two of the greatest characters in the entire series such as Reptile and Jax. 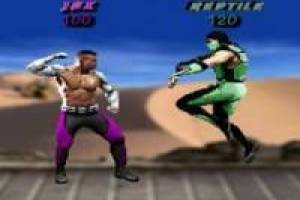 Both characters joined the cast of Mortal Kombat in the second of the games and since then they have become one of the favorites and essential for players. Jax is a soldier who prepares for the great war by improving his arms and for this he places some indestructible bionic implants that will be his hallmark in the game. For its part, Reptile is the last member of the Raptor breed, a tribe of lizardmen. Among his abilities are the invisibility, acute senses and speed that will serve him well in the battles of Mortal Kombat. 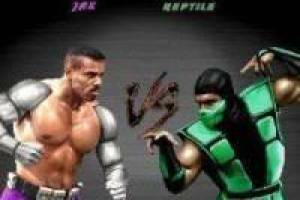 Both characters are among those who appear in more Mortal Kombat games and is part of their success among the players in the series. In this new online game, we can carry out the final battle between these two characters. You will have to handle Jax and you will have to defeat Reptile using your skills like the energy wave or the earth tremor, one of the most used special movements of Jax. Get weak Reptile before it is he who ends your life in this battle of Mortal Kombat X. Enjoy the game Mortal kombat x, it's free, it's one of our mortal kombat games we've selected.